Charlotte Dolinsky is not above playing dress-up and telling a few lies to find out what happened to her only brother. In fact, that is exactly what she s come to Lancaster County to do. Now, calling herself Mary and slipping on a kapp, Charlotte will lie her way into the confidence of anyone who knows why Ethan had to die. Unless she gets found out first. But when Charlotte befriends a quiet Amish man named Isaac Miller, she begins to rethink her motives. And with a little help from a friend back home, Charlotte might find out that love comes packaged in ways she couldn t have foreseen. Isaac s been caring for his cancer-stricken father and sympathizing with his frustrated mother for three difficult years. And that means he hasn t been dating. He believes Hannah King is the woman for him, but Hannah is still grieving the loss of her fiance, and Isaac has all he can handle on the farm. When Hannah s family plays host to a woman named Mary, their new cousin shakes things up for all of them. As Charlotte digs deeper into the mystery of Ethan s death, she finds more than she d bargained for in the community he once called home. But will she ever learn the truth? And what will the community and her new family do if they learn the truth about her?" 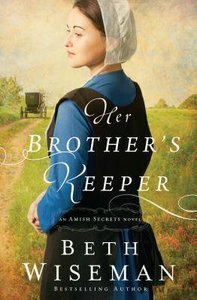 About "Her Brother's Keeper (Large Print) (#01 in Amish Secrets Novel Series)"